Montpelier, VT – Winter will be here before we know it, and to prepare for another ski and snowboard season, Vermont’s resorts have been hard at work improving and expanding upon their resort offerings like season passes, base lodges, off slope activities and of course, trails, lifts and snowmaking. So, what’s new for the 2017-18 season in Vermont? Find out below and start planning your sick days! Bolton Valley is upgrading its snowmaking system prior to the 2017-18 winter season. The pumps at the Timberline pumphouse will be balanced, allowing for more water to be pushed uphill more quickly. The resort is also expanding its gun and hose inventory. Combined, these two upgrades will allow the resort to blow snow in multiple locations at the same time. The additional guns and hoses will also reduce downtime when the crews need to change locations. The overall benefit will be more snow earlier in the season and more trails getting covered faster than last year. 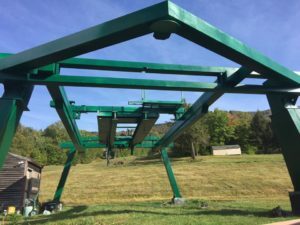 Bromley Mountain is upgrading its snowmaking artillery with 10 new high-efficiency SnowGun Technologies guns this winter, and fine-tuning its air compressors to make snow more efficiently. This enhanced firepower will allow the resort to make snow on its Learning Zone and teaching terrain starting with opening weekend, planned for Nov. 25, weather permitting. Previously, the Snowsports School opened later in mid-December. 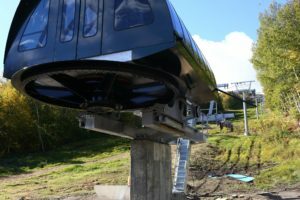 Killington Resort continues to replace snowmaking infrastructure at both Killington and Pico Mountain to ensure their ability to deliver a consistent ski and ride experience, highlighted by a partnership with Efficiency Vermont to add 163 new low energy tower snow guns for a total investment of $1.7 million this summer. This significant increase in low energy tower guns, along with a number of other critical system improvements, not only push’s the resort closer to a sustainable operation, but allows Killington to open ski terrain much more quickly and efficiently. Best-in-class snowmaking is a key reason Killington is able to host the Audi FIS Ski World Cup in November. In total, Killington Resort will earmark $1.7 million in snowmaking improvements and upgrades for 2018, and another $965,000 for three new grooming snowcats. 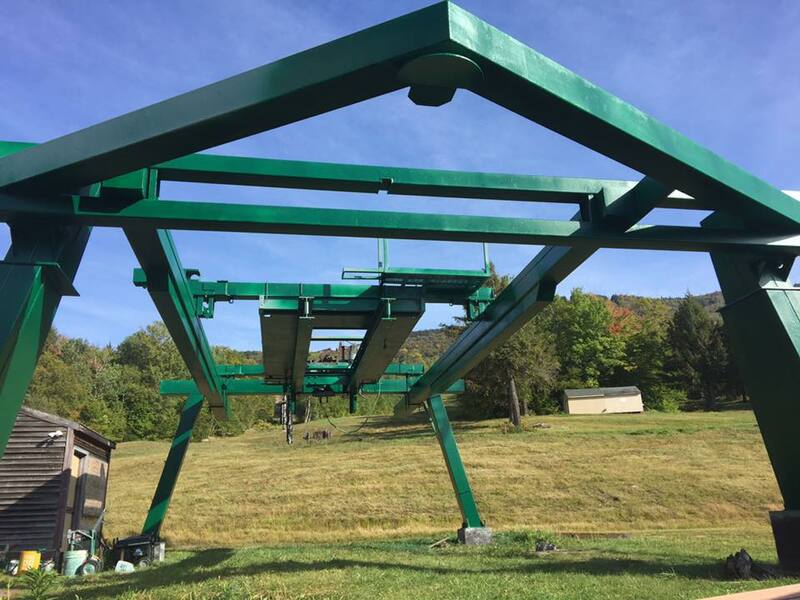 As design and pricing is ongoing for a proposed new South Ridge lift at Killington for 2018/19, existing ski lifts are being upgraded. The Snowdon Triple is undergoing significant upgrades over two years with new haul rope, additional towers, a mid-station, new communications infrastructure and lift line tower heads while the K-1 Express Gondola, Sunrise Village Triple and Superstar Express Quad also receive upgraded equipment. These improvements are part of an annual program to upgrade older lift technology at the mountain. Magic Mountain’s new ownership continues its capital investment in one of Vermont’s throwback ski areas. After winning Liftopia’s award for best ski area in North America, Ski Magic LLC builds on its successful inaugural winter by putting more capital to work expanding the snowmaking system, adding two new lifts and enhancing the classic lodge where the Black Line Tavern is recognized as one of the East’s most spirited après ski scenes. Key to Ski Magic’s efforts is broadening its ski offering to welcome more beginner, novice and intermediate skiers and riders. Magic will now have a new beginner area with a StarLift carpet conveyor lift for its Learning Center. The addition of the new Green Chair Lift servicing base-to-mid mountain intermediate and beginner terrain allows easier access to classic skiing for all ability levels. In combination with expanded snowmaking and grooming capabilities, the new Green Chair area will allow Magic to open earlier than ever by Thanksgiving. Separately Magic has another permitting process underway to improve the snowmaking pond, with that major project expected to commence next year. Working with the State of Vermont, the project is designed to both protect the quality of the water coming off the mountain’s streams into the tributary system while improving Magic’s access to water withdrawal for its planned future snowmaking needs. 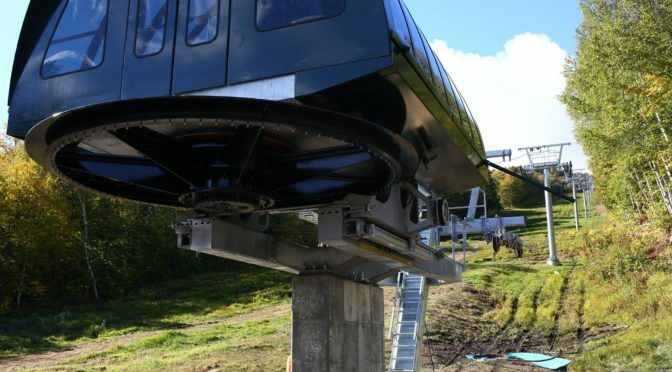 “This Act 250 permit represents a good portion of our capital commitment over the next couple of years to continue revitalizing a great natural resource that is Magic Mountain to the benefit our customers and the local southern Vermont region, including our hometown of Londonderry”, said Geoff Hatheway, President of SKI MAGIC LLC. Always a pioneer when it comes to snowmaking, Mount Snow Resort has completed $30 million in snowmaking upgrades for the upcoming season, including doubling their ability to make snow and increasing storage capacity six-fold. These upgrades give Mount Snow one of the most powerful snowmaking systems in the East, meaning more trails opening faster to start the season, and better coverage all winter long. Pico Mountain improves snowmaking this winter by increasing water capacity in their two snowmaking ponds with a dredging project completed this past summer. Additionally, key pipelines were replaced, valve stations upgraded and pump houses augmented to improve snowmaking at Pico Mountain at a total cost of $200,000. Stratton Mountain Resort’s 2017-18 fleet of 11 groomers includes two new Bison X Prinoth cats equipped with state-of-the-art fuel burning technology, decreasing harmful emissions, snow depth technology which guides the team in crafting seamless corduroy and terrain park features and transports guests to mid-mountain for a starlight gourmet dinner held every Saturday this winter. Combined with more than 1,200 efficient (HKD and fan) guns, Stratton’s operations team creates snow with less energy, including a 40% reduction in diesel use with the switch to electric compressors. Sugarbush Resort is also replacing its old ticket scanning system with RFID gates at all base lifts. Other projects to improve the guest experience include purchasing new SnowLogic guns, replacing the motor for the North Ridge Quad, installing a new snowmaking pipe on Which Way, a new air compressor for snowmaking and purchasing two new Pisten Bully groomers (one specifically designed for the terrain park). In addition, the resort is replacing two of its older double lifts, the Village Double and Sunshine Double, with new fixed-grip quads. Suicide Six’s trail improvements continue, with widening, stumping and thinning of glades in many areas across the map. Contour and grade changes will allow for faster and better snowmaking coverage, as well as newly constructed load and unload decks at the recently installed summit quad. Snowmaking improvements continue with the addition of new snow producers, as well as pipeline and infrastructure repairs. Look for better coverage and higher quality when you visit this season and expect more to come in the future. Over your head and under your feet, that’s what’s new at Bromley Mountain this winter season. The resort’s cozy base lodge is getting a whole new roof, the Sun Deck has been resurfaced (all the better to support après firepit hangs), and the rental equipment fleet has a superbly restocked quiver. Don’t own your own? Bromley is expanding the high-performance options in the rental shop this season with more new Rossignol Experience 80 skis, plus all new junior boots in the latest comfy model for happy kid feet. Additionally, Bromley will offer variable pricing for the first time this season. Similar to airline pricing, the further in advance skiers and riders purchase a lift ticket, the more they save versus the walk-up day rate. Conditions apply, including no refunds, but for visitors able to plan their trips in advance, consulting the resort’s online pricing chart and locking in a ticket price ahead of time, can help stretch their skiing and riding dollars. Jay Peak Resort is adding reels and rappelling to its list of activities for the coming winter. The resort will open a new 142-seat movie theater and Clip ‘n Climb climbing facility in the 15,000-square foot Clips and Reels recreation center opening at the Stateside area of the resort. And in an expanded focus on employee perks, Jay Peak is opening a new 12-plex of mountain cottages dedicated to employee housing. The cottages, along with Jay Peak’s renovation of its Inglenook Lodge, will provide the resort with the ability to house up to 150 employees. Killington Resort will kick off the 2017/18 season by late October, conditions permitting, with the return of the Audi FIS Ski World Cup taking place over Thanksgiving Weekend, November 24-26, with new entertainment opportunities kicking off the weekend on Friday. In November 2016, Killington shattered all expectations when it hosted the first Alpine World Cup event in the eastern US in 25 years. The inaugural World Cup Weekend at Killington drew an estimated 30,000 spectators, prompting U.S. Ski and Snowboard to propose a two-year agreement for Killington Resort to host the Audi FIS Ski World Cup in 2017 and 2018. 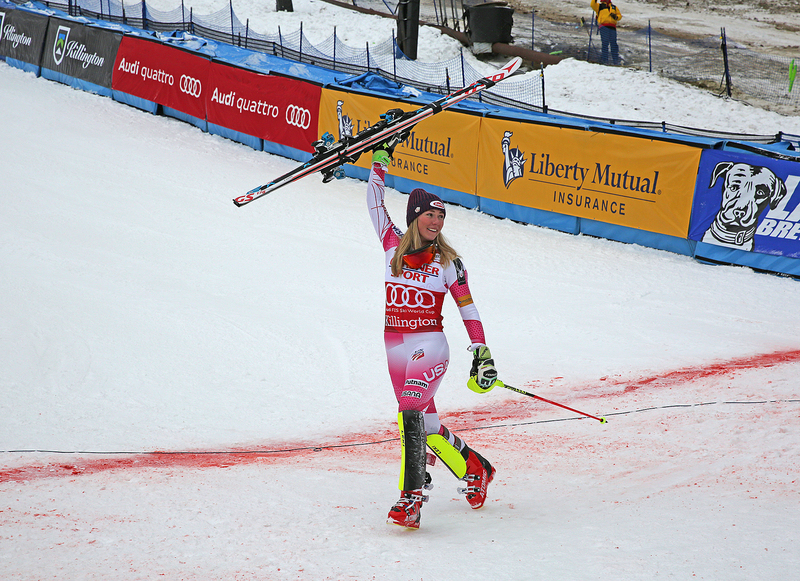 Mikaela Shiffrin celebrates victory in Killington last winter. The 2017-18 season also brings new, lower season pass pricing on their Unlimited Season Passes offering unrestricted access to the longest season in the East at an even better value than last season. Stowe Mountain Resort is now Epic for the 2017-18 winter season. Starting at $859, the Epic Pass offers unlimited, unrestricted access to Stowe Mountain Resort and the Epic Local Pass, $639, will offer 10 days of skiing at Stowe. The iconic, East Coast resort is the newest among 45 worldwide mountain destinations to be offered with the Epic Pass, which includes 10 destination resorts in the West. Sugarbush Resort has joined the Mountain Collective this season, an international alliance of ski destinations providing the Mountain Collective Pass. Also, for several years Sugarbush Resort has offered a military discount on season passes, and this year the resort invites active and retired military members, with valid ID, to ski and ride at Lincoln Peak and Mt. Ellen with a half-price day pass. Military will also receive a discount on 2017/18 season passes. In recognition of their service to the country, military members can purchase a discounted Adult Premium Pass for just $579 plus tax (retail price $999) and a Youth Premium Pass for $239 plus tax (retail price $399). Premium passes offer unlimited access to Lincoln Peak and Mt. Ellen all winter long, as well as 50% off day tickets at Mountain Collective resorts. In addition to military members, spouses and dependents under the age of 18 qualify for this discount. “Military members and their families continue to make incredible sacrifices for our country. At Sugarbush, we are honored to provide these men and women with benefits that enable them to enjoy our mountain,” says Sugarbush President Win Smith. North America’s first cross-country skiing center is turning 50 this winter! Join Trapp Family Lodge in the celebration from January 20-26 for a week of events including a celebration at the Bierhall, a ski with the von Trapps and a specialty brew by von Trapp Brewing. They’ll be celebrating all winter.